Turducken is fast becoming a popular recipe for Thanksgiving. The term turducken comes from the combination of tur(key), duck, and (chick)en because the dish is actually a chicken stuffed inside a duck which is then stuffed inside a turkey. When sliced, each piece contains portions of chicken, duck, and turkey with stuffing in between the layers. 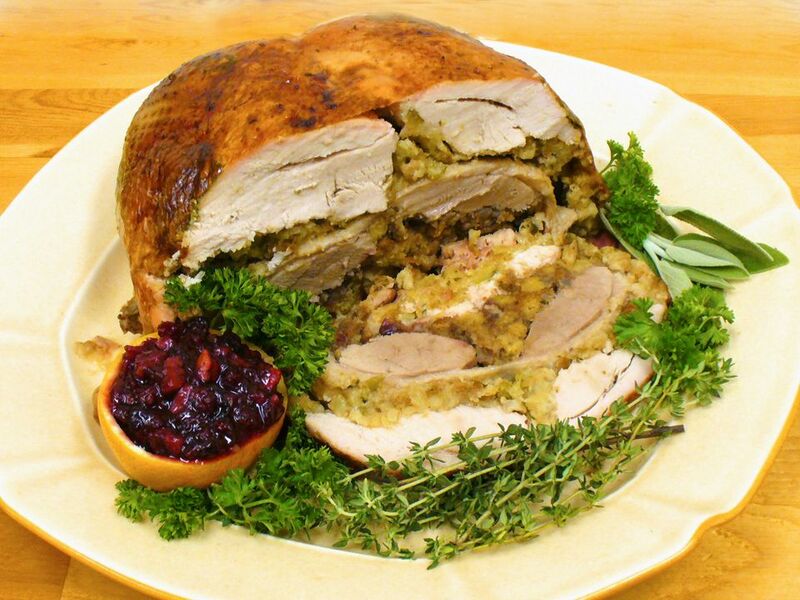 Turducken is not difficult to make, but it is a little time-consuming, so plan on adequate preparation time. The end result is a worthy showstopper. Make sure the turkey, duck, and chicken are already deboned (save the bones for stock) before you begin to assemble the turducken. Also, keep all of the poultry refrigerated until you are ready to use it and do not assemble the turducken until it's ready to go in the oven in order to avoid foodborne illness from contaminated stuffing. Measure out 2 1/4 cups of bread stuffing and set aside in a bowl. Place 1 1/2 cups of the cornbread stuffing aside in another bowl. Place remaining 1/2 cup of bread stuffing in a third bowl and add the remaining 1/2 cup of the cornbread stuffing. Add the whole berry cranberry sauce and pecans and toss gently to combine. You should now have 3 separate bowls of stuffings. In a food processor fitted with the metal blade, combine butter, garlic, sage, and thyme until the herbs are finely chopped. Gently run your hand under the turkey skin to make sort of a pocket, but do not separate the skin completely from the meat. Distribute the butter herb mixture evenly under the skin. Rub the skin with the browning sauce, then the olive oil. Sprinkle generously with kosher salt and freshly ground pepper. Flip the turkey over so it is open and skin-side down. Sprinkle with salt and pepper. Spread bread stuffing evenly over turkey cavity. Place duck on top of bread stuffing, skin-side down. Spread cranberry nut stuffing on top of open duck cavity. Top with chicken, skin-side down. Spread cornbread stuffing on top of the open chicken cavity. Skewer the back of the chicken closed. Bring up the sides of the duck to cover the chicken. Skewer the back of the duck closed. Repeat process with the turkey. Carefully turn the turducken over, so it is seam-side down and breast-side up. Remove all skewers except the last one holding the turkey together. Place turducken in a heavy roaster. Roast 3 to 4 hours, until a meat thermometer inserted in the very center of the chicken stuffing reaches 165 F.
Baste once per hour with pan juices. If turducken begins to get too brown, tent loosely with heavy-duty aluminum foil that has been coated with vegetable spray. Let turducken rest 30 minutes before carving. Slice turducken across the breast to show off each layer.